Crushed by Your Calendar? Use PowerPivot to analyze why ! REDMOND, Wash. — April 27, 2011 — As tools, email and calendars go one of two ways for many people. “Your calendar can be on top of you, or you can be on top of your calendar,” said Tom Casey, corporate vice president of Microsoft’s Business Platform Division. To ensure he continues to operate in the latter group, Casey and his executive assistant, Melissa Krohn, are beta testers for a new business intelligence app called Calendar Analytics. 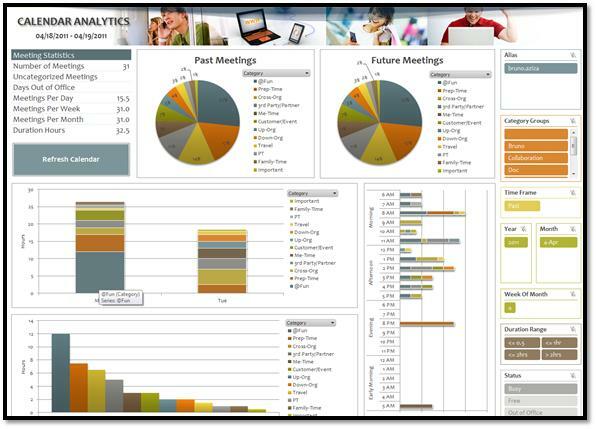 The PowerPivot application retrieves meeting and other information from Exchange and presents it in a simple, easy-to-read dashboard they can use to analyze (and sometimes even change) how the executive uses his time compared to his priorities. In honor of Administrative Professionals’ Day today, Microsoft’s Business Intelligence team is offering the application free along with an informational video to introduce the app. For Casey and Krohn, the information analysis helps ensure day-to-day work is contributing to larger goals. “At the end of the day, it’s helping him, and it’s helping me manage his calendar better, and making sure I am scheduling meetings that are going to align with his commitments,” Krohn said. On a day that most people give administrative professionals flowers, today they can have “the magic of software,” said Bruno Aziza, director of Microsoft’s Business Intelligence. In an email-and-calendar-driven world, having a tool for everyone from administrative professionals to information workers to executives to analyze how time is spent is invaluable, he said. “We only have a set amount of hours available throughout the week,” Aziza said, adding that the biggest difference in competitive business environments can be how effectively people use their time.